The TwinCAT 3 EventLogger provides an interface for the exchange of messages between TwinCAT components and non-TwinCAT components. This documentation is aimed at the user of the TwinCAT 3 EventLogger. Information about how the TwinCAT 3 EventLogger is used by different TwinCAT 3 components can be found in the respective product documentations. 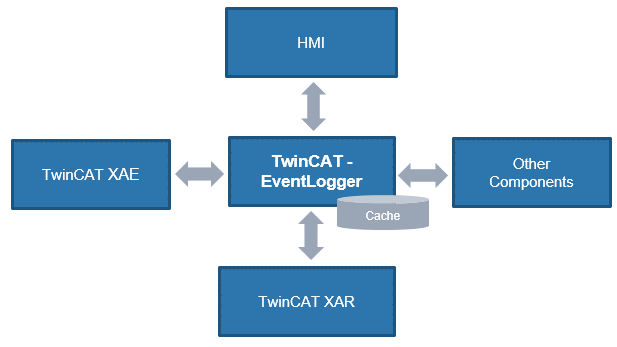 All the components of the TwinCAT 3 EventLogger are present in the respective basic installation. Various interfaces are included in the TwinCAT 3 Engineering for programming. The necessary modules and libraries are part of the corresponding runtime. Use of the TwinCAT 3 EventLogger is free of license fees.